The graduate school and career advice panelists spoke to a packed room at the 7th Annual NIMBioS Undergraduate Research Conference at the Interface of Mathematics and Biology. With topics ranging from modeling an Ebola outbreak to studies of pathogenic genetic mutations, the seventh annual Undergraduate Research Conference at the Interface of Mathematics and Biology was a success with more than 130 undergraduates and faculty participating. More than 50 presentations — talks and posters — were given by student researchers from all over the country, and many of the projects were presented by interdisciplinary student teams. While new participants come every year, there are also those that love to return again and again. Richard Schugart, an associate professor of mathematics from Western Kentucky University and currently on sabbatical at NIMBioS, observed that he has attended and brought students to the conference every year since it began in 2009. Maria Siopsis, an associate professor of mathematics at Maryville College, explained that one reason she returns is because it gives her many ideas for examples she use with her students. University of Tennessee Associate Professor of Ecology and NIMBioS Associate Director for Postdoctoral Activities Paul Armsworth finds the conference a great venue for recruiting top graduate students. Several successful students currently in his department were conference participants at one time. 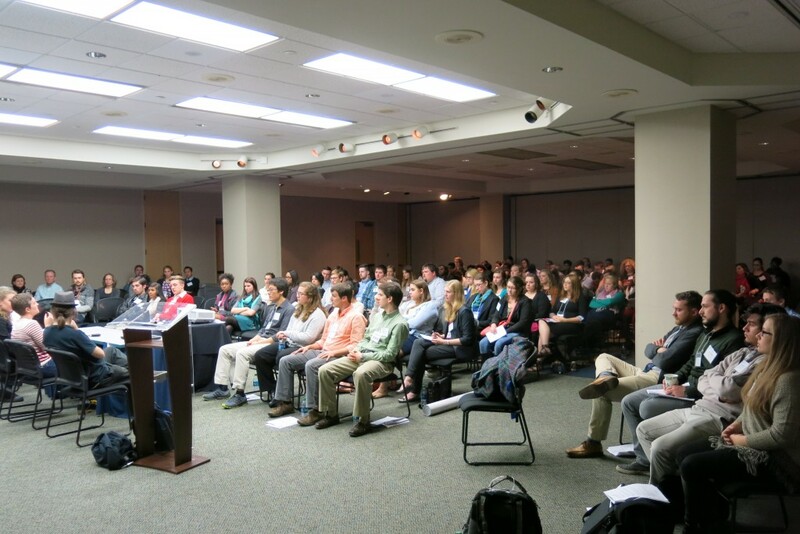 The program included keynote and featured talks, a graduate school showcase, and a career and graduate school panel. Keynote speaker Robert Smith? from the University of Ottawa spoke about “Neglected Tropical Diseases and the Next Disease to be Eradicated.” A humorous talk on the second day by Smith? engaged students in how to model a zombie outbreak using the same mathematics one might use for other kinds of epidemics. Later, featured speaker Rachel Lenhart, a medical student at the University of Wisconsin-Madison, spoke about her use of computational approaches to help surgeons better understand and refine their treatment of children with motor disabilities. The photos say it all! Check out our Flickr photo album from the conference. Also, a steady stream of tweets from the conference provide some great highlights. Make sure to save the date for next year’s conference: Oct. 8-9, 2016! This entry was posted in careers, conference, Education/Outreach, high school, Leadership, research, sabbaticals, SRE, undergraduates and tagged careers, conferences, Education, Education/Outreach, leadership, research, SRE, STEM, undergraduates. Bookmark the permalink.